Queelister's Place: The Party Continues!! Double Delights has a special challenge this week to celebrate the birthday of OWH, you can use ANY Designed 2 Delight Images. Your cards may be any theme as long as they are within the posted deadline, go here to find out more. If you participate in this challenge you will be sent a cute Star Spangled Snownman image from Faith. Here is the card I did for Faith's progressive challenge over at Delightful Inspiration. This cute little image is called Scaredy Cat and can be found over at her Designed 2 Delight stamp shop.This card will also be entered into, Midnight Madness- sketch challenge, and Paper Sundaes- Fall/ Halloween theme. What a couple of wonderful cards. I really love the trim on the pumpkin card. I have the punch and it looks wonderful the way you have used it. Great images of course and wonderful papers. Great ribbon trim on your first card too :) Thank you so much for joining in the fun this week at the Midnight Madness sketch challenge. lovely card and great autumn colours. Thanks for joining us at Paper Sundaes this week. Awesome cards using the wonderful D2D images! 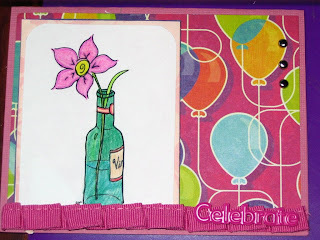 And I love the balloon patterned paper on the birthday card! Very cool! We are so happy to have you at the Designed2Delight Artist's Challenge, and thank you for the cards to the troops! very pretty! Lovely colors and I love the punched trim/ribbon? you used! Love the fall colors and warm feel you have created. The image is very cute! What adorable cards! 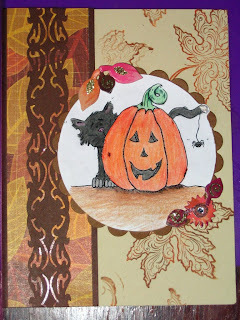 I especially like the cat and pumpkin one with the gorgeous leave image on the background dp! Lovely trim and little leaves! Thanks for playing along with us again this week.